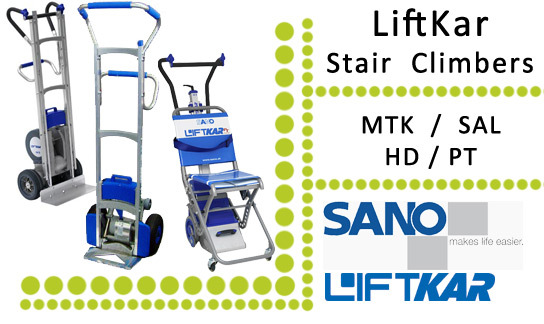 The Liftkar PT is designed to aid the transportation of people up and down stairs. The Liftkar PT comes in several options either with a built in seat or the ability to carry a wheelchair. The PT Uni allows for virtually any type of wheelchair to be rolled on to the unit and locked into place. You are then ready to take somebody up and down stairs with ease. Ideal for previously inaccessible places to people with wheelchairs. We provide two types of Liftkar PT that come complete with their own seat. The PT Fold - This is our rapid-response unit for transporting patients. With a small wheelbase it is perfect for steep and narrow steps. The PT S - There are two models of PT S and PT Outdoor available; the 150 (designed to transport persons weighing up to 150 kg / 23 stone) and the 120 ( up to 120 Kg / 18 stone ).